Would that which we call Gradius by any other word play as well? I decided to start reviewing old 1980s games I have in my collection, typically games most of you really have never heard of. Good or bad, no matter. This is, in a way, a continuation of OkändOnsdag, except now I'm focusing on a single game and without a schedule to adhere to. I lied. I'm pretty sure Laser Squad isn't the best-known title I have in my collection. This one is. I just forgot about it. 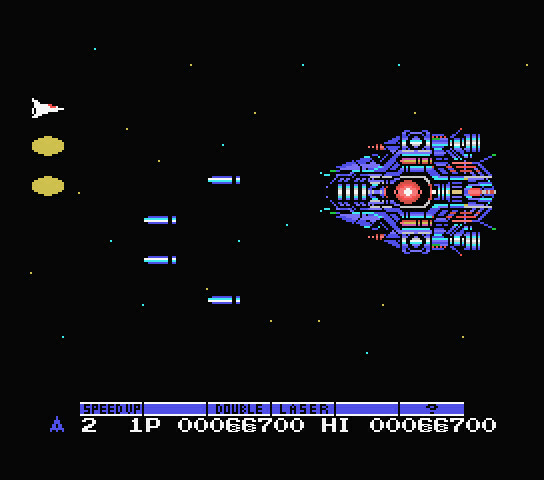 Gradius is one of Konami's most iconic franchises. 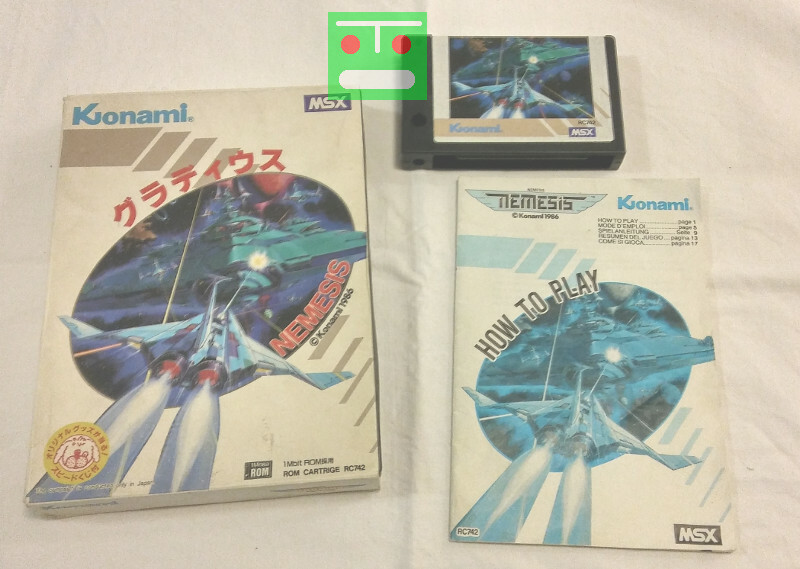 The series may have started with Scramble (1981), or Gradius (1985) -- I don't know if Konami themselves know, since only some versions of the series history include Scramble. If you know katakana, you can read what it says on the cover: "Guradiusu" or something very close to it. Even the top and the bottom of the case (not really shown) have the "Gradius" like on the NES title screen. And like so many of Konami's franchises, Gradius has laid dormant for a good while now: its most recent appearance is probably Gradius Rebirth (M2/Konami, 2008) on WiiWare. And a pachislot game in 2011. Aww, don't tell me you were surprised? Mind you, there's Gradius V (Treasure/Konami, 2004) available at least here on PSN for PS3; it's originally a PS2 title and Treasure's name is renowned in shooter circles for a reason (Gunstar Heroes (1993), Radiant Silvergun (1998), Sin and Punishment (2000), Ikaruga (2001)). 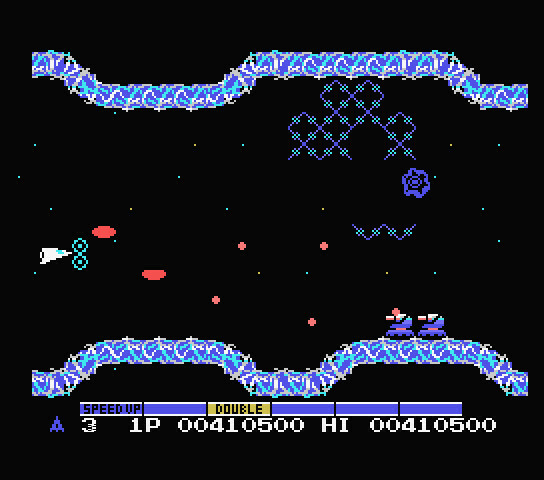 Scramble is one of the first if not the first side-scrolling shmup where the levels have distinct look and the geometry is more than a mere backdrop, like a field of stars. As something of a surprise to me, I looked closer at which shmups have levels with geometry that serves as obstacles. Back in the 90s, I assumed that was a given, having played games like ZeroWing (Toaplan), Darius Twin (Taito), Axelay (Konami), Saint Dragon (NMK/Jaleco), Stargunner (WizardWorks/Apogee), R-Type (Irem) and Hellfire (Toaplan). I assumed wrong. Today, I don't think I've played a bullet hell where the player has to avoid indestructible parts of the background. Some games have presumably indestructible ships whose weapons create an impassable wall (like Danmaku Unlimited 3 (Doragon Entertainment, 2018)), but Touhou titles (Team Shanghai Alice), Truxton (Toaplan), Aero Fighters 2 (Video System), Strikers 1945 (Psikyo) have none (that I know of). There are vertical-scrolling shooters that have obstacles like Xenon 2 Megablast (Bitmap Brothers/The Assembly Line/Image Works) and Overkill (Tech-Noir/Epic Megagames), but I doubt it's nowhere near as much given as it is with horizontal ones. Plot? There is a plot to this? Steal the enemy's power capsule and fight your way through!! Looking at the manual, we learn a lot more. The planet Nemesis, a peaceful Earth-like world, is now under an all-out space attack from its old enemies, beings from the sub-space star cluster of Bacterion. The people of Nemesis are in danger of being completely destroyed by the amoeboid Bacterions. You are the last hope for the gentle people of Nemesis! You will need all your courage and concentration to win. Get ready to blast off! The story takes up one of the four pages the manual has per language. Proportionally speaking, that's far more than I expected. 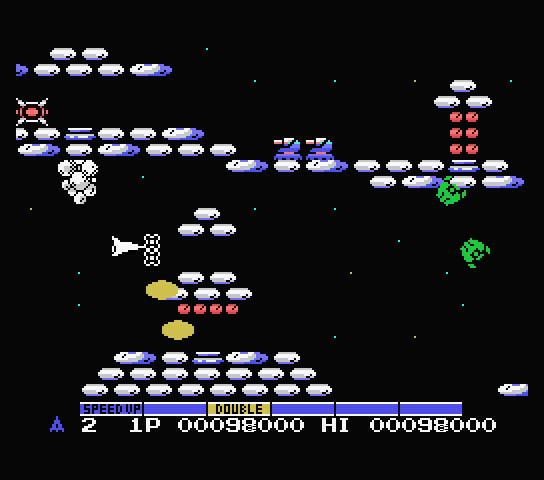 The player collects tokens that move the highlighting on the power-up bar forward; pressing the second fire button buys the player that powerup and re-sets the highlighting. 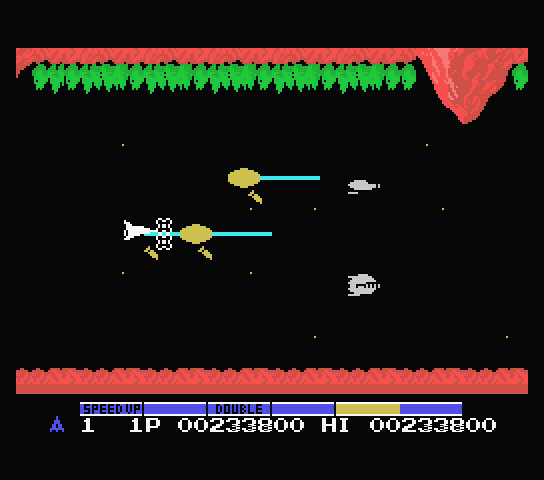 The weapons are also iconic for the franchise: speedups, bombs, double (shoot straight and diagonally upwards), laser and the force field that'll protect the player from a few hits from the front. Then there are the checkpoints: if the player dies, the game continues from an earlier checkpoint with all powerups lost and the powerup highlight moved to the first spot if even that. As you might guess, dying was a losing proposition, even moreso than in other games. The stages often follow a certain pattern. First, an approach section in open space to let the player collect powerup capsules. Second, a part with indestructible terrain or similar obstacles (with the exception of the antennoid stage). Third, a challenge section (or miniboss), be it two volcanoes erupting, a wave of special enemies or so. And finally, a bossfight. In this game, they're against the same boss in all but the last two stages, with the advise not heard in this version: shoot the core. Don't shoot the core yet, it's impervious to damage while it's red. You might've wondered what the Warp Rattler was? Well, that's Vic Viper by another name. Level 1. Today, now that I understand the technical limitations of the system, I can freely envy how well the background graphics (plus the big explosion) work around the limitation of having only two colours in every one-by-eight pixel row. Level 2. The green enemies are sprites, the turrets and the powerup capsule are background graphics. Level 3. Moai. Of course there had to be moai already in this title. Level 4. This is disappointingly using graphics very similar to level 1. The erupting upside-down volcano, though, is a major pain. Level 5. This level was not on NES or the arcade original, and on PC-Engine, it looked noticeably different. The skeletons are like moai but they rise out of ground and then start spewing destroyable enemies. Level 6. The manual calls these "antennoids". What a short stage this is. There are no powerup capsules to collect past the first phase -- so don't die. Level 7. 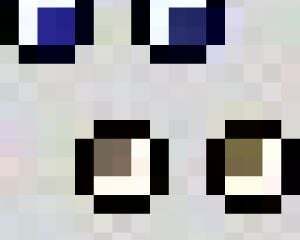 I wonder if that blue blob is a Bacterion. Level 8. As I fumbled for the button to take the screenshot, I died just before I got back to playing the game. Then I failed to select continue in time before getting to the "final boss". There are also a few bonus stages, but given how I got to them for the first time only last week, I didn't look closer at them. 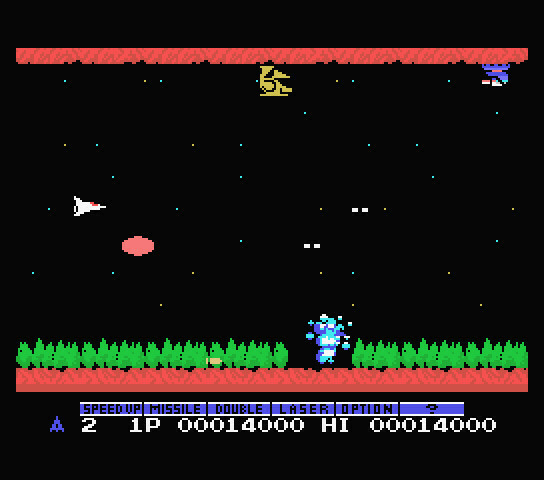 The game controls well enough -- while two-button MSX joysticks are supported, the more common ones with all buttons mapping to one effective button can also be used: N on the keyboard can be used to purchase the powerups. The keyboard is needed to pause the game (F1) and continue (F5). As for the multiplayer, it's hotseat only. No simultaneous co-op. I understand the Konami code doesn't work, but the game has other cheat codes. The problems MSX1 hardware had with scrolling are obvious here. The screen scrolls in jerky 8-pixel steps, with the exception of the stars in the background. 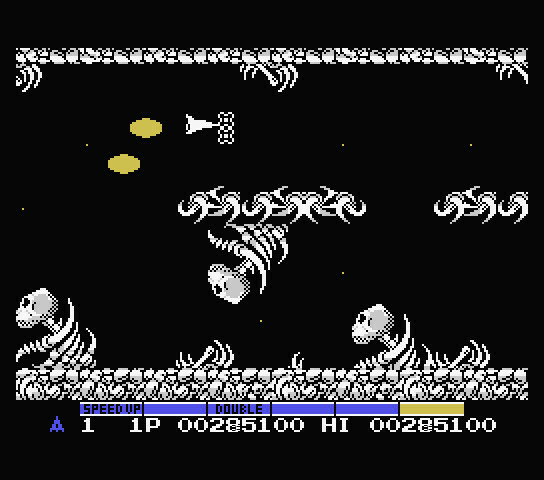 Most larger enemies are also made of characters, in particular the lines of enemies that start off the first stage, to avoid having more than four sprites on the same row. This makes them move in similar increments as well. I'm probably biased in that I played more Nemesis on MSX than Gradius on NES ever, but the music, even without the SCC additions, is good. Konami had wildly different ports of their shmups. They weren't as bad as Capcom about it, but still. To confuse the situation further, their names were this and that. 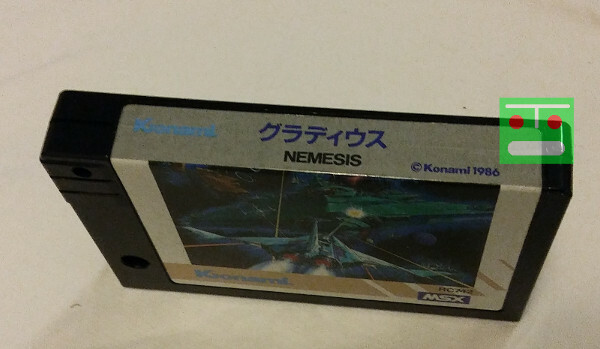 I don't really know what is the difference between Nemesis and Gradius outside of release region: the Japanese name was Gradius and Nemesis was the western name... except on Nintendo. Just look at the case at the start of this blog or the cartridge below. The Gameboy port of Gradius was called Nemesis and the Gradius Rebirth on WiiWare is, if I were to trust a longplay on Youtube, a prequel to Nemesis 2. That game is very different from Gradius II: Gofer no Yabou, and so is Nemesis 3. 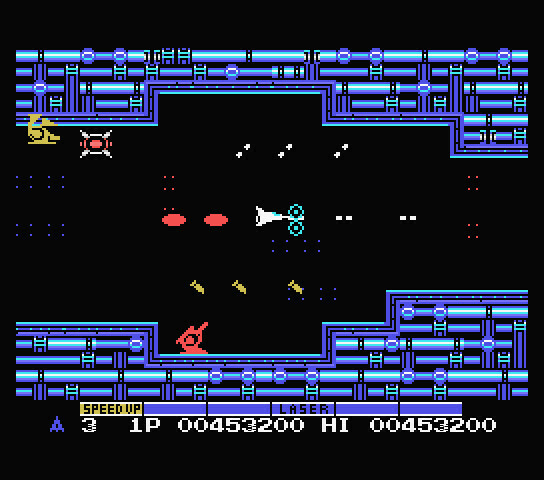 It's a pity, since Nemesis 2 had the idea of letting the player fly into the core of the destroyed enemies and collect new weapons like down- and up-lasers. 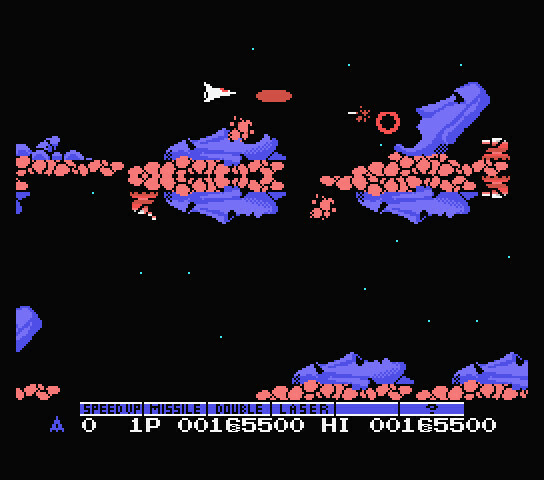 Likewise, Nemesis 3 had secret weapons for the different ships the player could collect. Salamander (Life Force) is arguably a part of both Gradius and Nemesis series; even the background story of Nemesis 3 mentions both Venom (the enemy in Nemesis 2) and the Salamander. 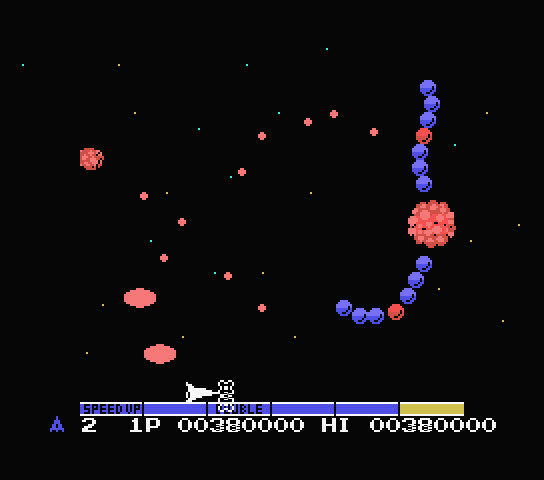 While MSX version of Salamander and the NES game Life Force had the powerup system like in Gradius, the MSX version had extra weapons the player could unlock. On TG-16, the game drops the powerup bar altogether. Plus the arcade original didn't have that either, nor did the C64 version. If it weren't for the one stage MSX version has but the NES version doesn't, there's not much reason to play this version over that one. Of the shoot'em-ups available on MSX1, though, this is a good one: behind the later games in the series, but still a solid showing.